I will start with a last word on the lead-photo in Issue 1017, the TT machine carrying no. 48, since the VMCC has very kindly sent me a fullsome report on this, which fixes much, but still leaves a mystery. The photo originally appeared in the MotorCycle for May 28th, 1914. The only ABC in the Junior race was ridden by J. Emerson: his machine was listed as being of 58.5 x 64 = 345 cc., with a Renold chain, Ruthardt magneto, Hutchinson tyres, and Claudel-Hobson carburettor. But his riding number was 23. No. 48 in the Junior race was E. Smith, on a 2 3/4 Peco. Can it be that the no. 48-plate was a left-over from a previous event, due for updating? Or is the photo, quite simply, of his Senior machine? I think we'll never know. Certainly, J. Emerson did also ride in the Senior TT, on a 3 1/2 ABC. There were two other ABCs in this race, ridden by J. Harrison-Watson and A. Wray. Giovanni took one look at the ABC Garage photo in the last issue, and declared it to be a product of Astley Brook & Co Ltd, the celebrated fireproof garage maker of nineteen-thirty's Leeds. Asbestos in those days wasn't considered a health hazard, and in one way at least, it was less dangerous than a seasoned dry wooden structure. 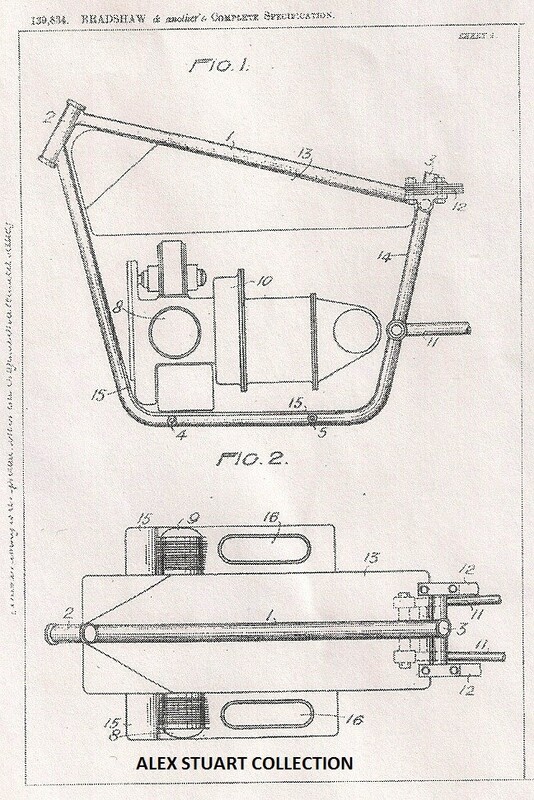 This drawing is from Patent No. 139834, and refers to "a bent steel plate which forms the protective front leg shield and underplate for a horizontally opposed motorcycle engine with longitudinal crank shaft" (another joint GB/ABC patent). Only, it seems to show everything except the essential plate! 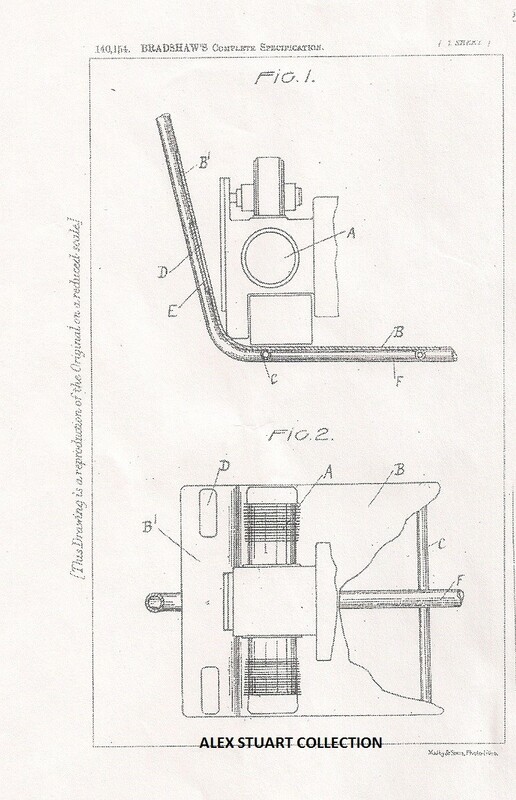 Here we have two figures from Patent No. 140154, which is described as a "Variation on Patent No. 139834, with louvres for improved air cooling (of a transverse flat twin engine)". Are we to deduce that Mr. Bradshaw overlooked the refreshing benefits of a breeze around his cylinders in his earlier design? The same draughtsman seems to have produced all the figures: was this the Master's hand? John Emanuel has spent time in the past, pondering various design aspects of the Sopwith, but now he's devoting some serious effort to it. He's sketched out a three-piece crankshaft that will employ roller big-end bearings, but with their own inner races. An improved camshaft layout is envisaged, with mushroom followers, lighter pushrods, and smaller (lighter) valves. There will be a circulatory oil system, with concealed radiators in the footboards, and cast-iron cylinders. And what is the goal of all this? Why, just to make an engine that can produce its claimed 8 BHP under all circumstances, and that will continue to do so for many years with only minimal maintenance. I hope that John will keep us posted of significant developments as they are achieved. http://abcroadmotors.co.uk/ . I think you'll find it pretty impressive!